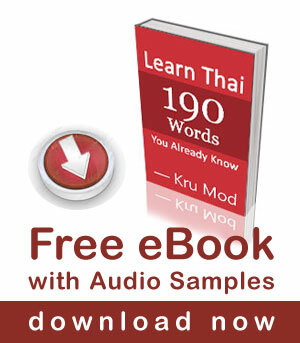 One Baht is divisible into 100 Satang. The 10-Baht coin is a silver ring with a brass center. The coin replaced a 10-Baht bill in the early 1990’s. The back of the 10-Baht coin depicts Wat Arun (วัดอรุณ) in Bangkok. The diameter is 26 mm. 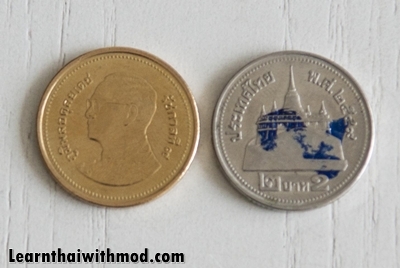 The 5-Baht coin is slightly smaller than the 10-Baht coin (24mm). The reverse features Wat Benjamabophit (วัดเบญจมบพิตร) or the Marble Temple. The 2-Baht coin has two designs. The new 2-baht coin design is in brass color. 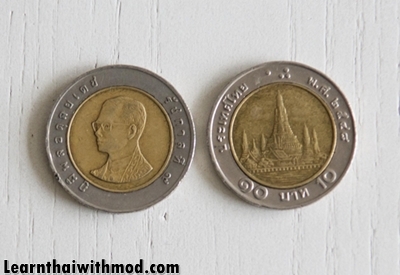 It features H.M. King Bhumibol Adulyadej, on the obverse. The reverse design depicts the Golden Mountain at Wat Saket Ratcha Wora Maha Wihan in Bangkok. The original two-baht coin was minted 2005-2007, but it is still in used. It looks similar to one-Baht coin so many people write number two on the coin to prevent the mix up. The diameter is 21.75 mm. 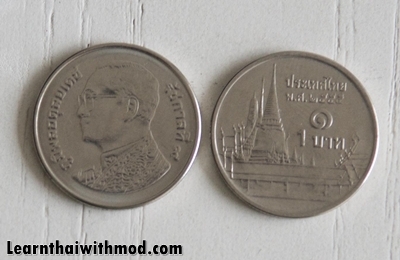 The one-Baht coin is silver(20mm). 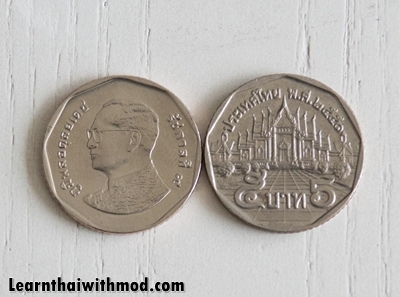 The back of the one-Baht coin displays the chedis of the Temple of the Emerald Buddha. The fifty-satang coin is copper. It’s currency unit equivalent to one-half of one Thai baht. The back features the chedi at Wat Prathat Doi Suthep in Chiang Mai. The diameter is 18mm. The 25-Satang piece is a tiny brass coin (16mm). *Both the 25- and 50-Satang coins are mostly used in supermarkets and convenience stores like 7-Eleven. Learning point: Ngern (เงิน) is Thai for silver as well as the general term for money, reflecting the fact that the baht (or tical) is foremost a unit of weight for precious metals and gemstones. coin in Thai is called เหรียญ /rĭan/. Click here to learn about Thai banknotes. Have you ever confused the Thai coin denominations? 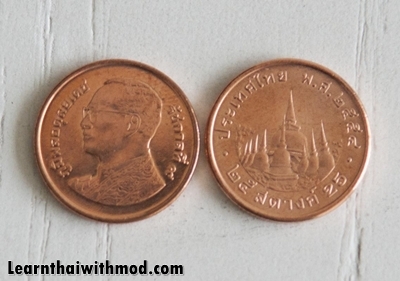 The copper coin is 25 satang which is less than one Baht. Hi Mod, can please show us some pictures of the valuable baht coins and can you tell us also how much it cost. I would really appreciate it. Hi Mod, I have a 5- baht silver coin. Same one you showed on the second photo. The reverse features wat benjamabophit or the marbles temples. Since it is a rare coin, may i ask what is the value of this coin? And where can we sell it? Hi Sharon, I think the 5-Baht coin you have is not considered a rare item. I am afraid you can’t sell it now. Hi Mod, can you show us some photos/video on what are the valuable coins of Thailand? I have a 5-Baht that looks exactly the same 5-Baht silver coin you show on the photo but the man (i assume he is the king) on the coin looks much more younger. Please can you tell me the year this coin was produced? No Mod, I’m very happy its the original from 1986 or 1984 i don’t remember right now but its the oldest of its type i read the date on the coin. I know it’s worth just its value but i was very surprised it was so old. Thank you. Us value of a 10 baht.coin ? please can you show pic of 50 satang coin – na ka! Thank you for your comment. I will add a picture of the coin as requested shortly. Let me find it. Definitely not old. The center part is brass. Thank you for your comment. I thought those 2 Baht coins are all gone. We have a new coin now. I should update the article. what is 5 baht coin worth? 5 Baht is about 0.15 U.S. dollars. Accoridng to xe.com, 5 THB = 0.144404 USD. How to decipher the year on coin? I’m agree with Mr.Lee comment, Thai coins are not silver. They’re steel, copper or brass. Some 50 cents or satang are steel plated with copper so it’s not a copper either. The ten baht coin has a silver colored ring; not silver metal. The one baht coin is not made out of silver. They are either steel or aluminum. Run a magnet over a one baht coin and you will quickly see if it is steel or aluminum. If any of these coins were made from silver metal, they would be worth much more than one baht. Whenever a metal exceeds the value of the coin minted, that coin disappears from circulation, and governments replace the metal with a less valuable alternative. U.S. coins before 1964 contained silver, but since that time they do not. Watch the price of copper. When it goes up significantly – as some predict – the 50 satang coin will be made from another less valuable metal, and your copper coins will be worth more than 50 satang from a copper dealer, who will melt them down. If the metal of a coin goes up very quickly to a high level, the government may try to confiscate the coins, and force you to exchange them for coins of a different metal. During World War 2 in the U.S., copper pennies were replaced with ones made of zinc. By the way, if you think that an aluminum one baht coin is silver, try this: Silver conducts heat better than any other metal, much better than aluminum. Hold a one baht coin between your thumb and index finger and run the edge through a candle flame. The aluminum coin will feel warm, but you can still hold it. If it were silver, you would have to drop it immediately because the heat would flow through it from the candle flame very quickly. can I pee on a coin? Please friends. Remember don’t disrespect by drawing on coin!